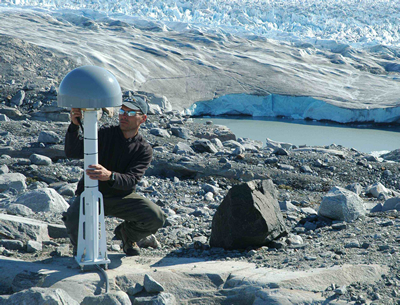 Twenty-three continuous GPS stations were installed in Greenland during August 2007. The GNET project is part of the International Polar Year (IPY) POLENET consortium and includes active participation of collaborators from Denmark, Luxemburg, and the USA for Greenland activities. The project's goal is to determine the steady vertical velocity field associated with postglacial rebound (PGR) which will provide GRACE, and any successor missions, with an accurate 'PGR correction', thereby suppressing the largest source of uncertainty in GRACE-based estimates of ice mass changes in Greenland. 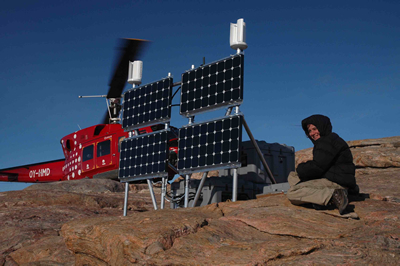 Three teams of 3-4 people were deployed in NW, SE and southern Greenland to install the stations. Recent innovations to the Polar remote CGPS station design allowed for rapid single day station deployments. Data from these sites are transmitted via the Iridium satellite system to the UNAVCO Archive. Installation of another approximately 17 stations is planned for next season to complete the network around the entire Greenland circumference. 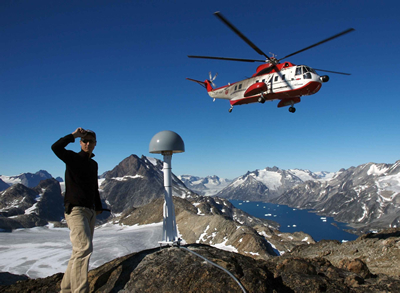 Figure 1 - Abel Brown from the Ohio State University awaiting pick-up after installing GPS station TIMM on Timmiariit Island in southeast Greenland. Figure 2 - Thomas Nylen of UNAVCO completes the antenna installation at GPS station KAGA above the Jakobshavn Gletscher/Kangia Icefjord. Figure 3 - Field engineer Marianne Okal at Doecker Smith Gletscher site DSGK. The system is powered by four 90W solar panels and two Forgen 500 wind turbines.